There are these four words that we use interchangeably. They are really not the same thing, so let’s talk about how they differ. Following a change all the way through transition, transformation and metamorphoses allows your light to shine for everyone around you. A Change is something we all know about. Every day we use the word many times, for little changes like change your shirt, change your pants, change the tv station, change the oil in your car, changing of the season, change the laundry from the washer to the dryer….and on and on and on! But then we each experience some changes that are bigger – like having a baby and becoming a parent, getting married or getting divorced, changing careers, or losing a loved one. These changes are different than the little every day ones because they start the process of inner change…which is transition. Change is a shift in external events or circumstances…transition is internal, it is changing your relationship with yourself. When transition happens, it is an invitation to explore. To question beliefs that you have held, values that you have embraced, relationships you have, the work you do in the world, your spiritual life and relationship, and how you want to live this gift of life. How you explore during transition is different also. It is an internal process. You may read and listen to podcasts and youtube videos. You may try new things as you explore. A lot of the time you prefer to be by yourself letting your mind wander across all the “facts”, “givens” and “ways things are” that you have accepted as “the truth”. A lot of times people find meditation, prayer, journaling and walking in nature to be really supporting during this process. It can be challenging…you may feel uncomfortable in your own skin as you explore, grow and create a new skin that fits you better. Nothing feels right or comfortable. You can’t go back but you haven’t reached forward yet. So why do it? Because the process of transition brings you to my next word…transformation. Transition is the process…"transformed you" is the result. I feel like you get to live a truer version of your true self. You create a new image of what you…an ideal you…is. And then you get to make it happen. Metamorphosis is the process of changing from a caterpillar into a beautiful butterfly. That’s what you get to do. You take all of the hard work of transition, you transform your inner life and then that beautiful you shines out for all to see. But you get to choose. Transition is an invitation. That means you can RSVP yes or you can RSVP sorry…too busy, can’t make it this time. You get to choose. If you would like some help making the choice that best supports you becoming the best version of yourself to shine in the world contact me today. 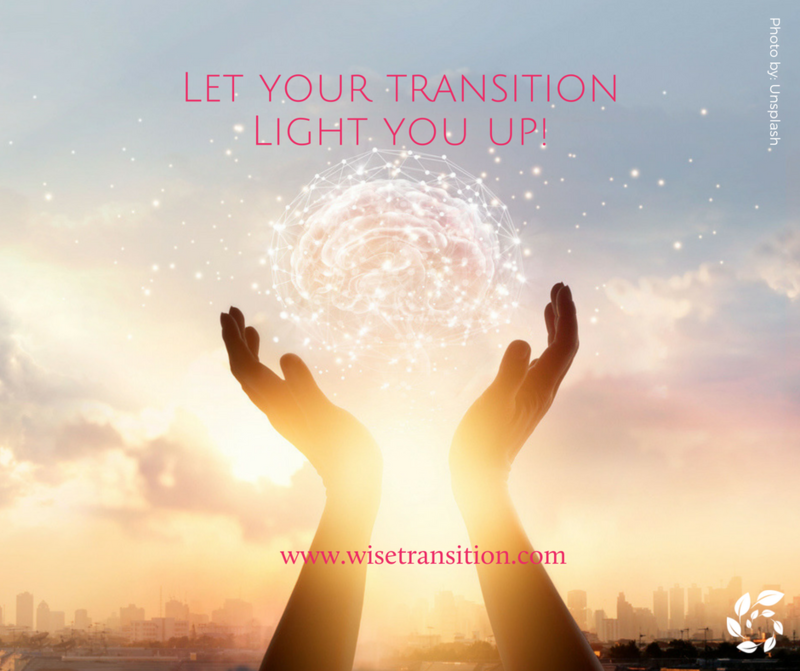 I am karen@wisetransition.com and I would love to support you as you answer the invitation for a wisetransition.